It Takes A Whole Village: Ten Dollars, Ten Minutes, Help The Sharing Foundation Change the Lives of Over 1,500 in Cambodia! Over the holidays, I was in Lowell, MA where there is a large Cambodian population. We take the kids there regularly to shop at the Cambodian grocery store, get our haircuts at the Cambodian beauty shop, and eat some beef lo lac at one of the local restaurants. 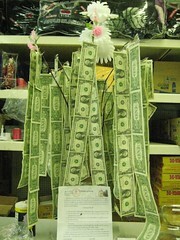 In the grocery store, I saw the above fund raising campaign to support a local temple. There is a tradition of micro-philanthropy here, although it isn't necessarily taken online. I talked up Sharing Foundation's America's Giving Challenge while I was getting a haircut and other patrons were interested, even touched by the work of the Sharing Foundation. Unfortunately, many don't have regular Internet access (or credit cards) so their support doesn't count towards the contest. But, there are a few wired Cambodians who have been able to contribute. Inspiring from article Cambodia facing uneducated future written by BBC News, I decided to make a change in this new year 2008 by donating some money to help The Sharing Foundation win the $50.000 from America's Giving Challenge. Even though my donation is not quite big, but at least it is counted as one. Well, I don't know what I can do as a single Cambodian citizen to help next generation of my country. But I know for sure that all of our contributions will make different. Our $10 that we spend on one time buffet can help one child to go to school for the whole month. For $50, we can help adult students with their English for the whole year!! This is absolutely what we can do as a person. That's Nhuong Son with his girlfriend Qing Guo. 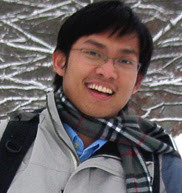 Nhuong has contributed and both he and his girlfriend are fundraising on behalf of the Sharing Foundation. There's also a whole village of bloggers helping with this cause lead by Michele Martin. Most recently, the awesome ChelPixie. The Sharing Foundation's programs have touched all the children of Roteang Village who have been immunized, full series. In the U.S., childhood immunizations are routine and taken for granted. 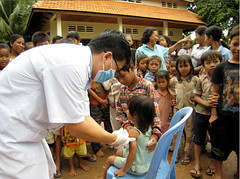 In Cambodia, rural children often die from preventable infection and disease. Cambodia's child mortality rate is among the world's highest. A Sharing Foundation project organized by Elephant, the Sharing Foundation's in-country director and the orphanage doctor, Volunteer Cambodian medical students helped administer over 7,000 individual shots, for Hepatitis B, and for Tetanus or DPT. College students get typhoid immunization as well.